The political struggle between the Venezuelan opposition and government has reached its endgame. Unlike before, the opposition now stands united behind a civil resistance campaign. Deeply unpopular, President Nicolás Maduro can only remain in power by establishing a full-fledged dictatorship. To this end, he is escalating repression and expanding his coercive powers by setting up new paramilitary forces. The international community could help prevent such a scenario by increasing pressure on the regime to accept talks with the opposition for a power-sharing agreement. Using a careful ‘wedging approach’, the splits now surfacing within the regime could provide an opening for a negotiated re-democratization. 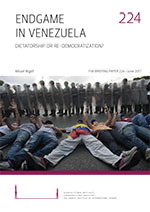 For re-democratization to take root, the interests of the armed forces and Chavistas currently enjoying an entrenched position in the Venezuelan state will need to be protected to some extent.